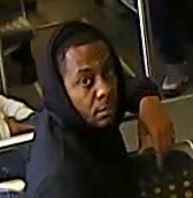 The Los Angeles County Sheriff’s Department, Transit Services Bureau (TSB) Detectives, are looking to identify a man who intentionally exposed himself in a sexually explicit manner in front of a female passenger while riding on the Metro Green Line, in the City of Lynwood, on Monday, December 10, 2018, at approx. 10:45 a.m. The suspect, who can be seen on train video, appears to have boarded at the Long Beach Metro Green Line Station. The victim stated that the suspect sat down across from her in the same train car. Train video shows that the suspect began exposing himself and attempting to get the victim’s attention. The suspect was engaged in the lewd act for many minutes when the victim finally did notice him. She stated that she was extremely offended and got up from her seat and moved to another part of the train car. The suspect can be seen making note of where the train car cameras were. He then can be seen exiting the train at the Aviation Station. The suspect is described as a male, Black, approximately 25 to 30 years-old, 5’8” tall, 168 pounds, with short black hair, a mustache, and a scruffy beard. He was wearing a black hoodie, blue jeans, and was carrying a black or dark grey backpack with a small, white, logo.